CHEA is three days in case you were wondering, though people can come for only one day or two. . We don’t mess around. We do the full three days. Today started with paper “breakfast bags” from the hotel. A brown bag with a napkin, apple, muffin, granola bar, and a mini bottle of water inside. I ate mine in bed while gathering the will to get up and take a shower. The convention starts at 8:30 officially, but the classes and workshops we wanted to go to were at 10:30, which made it nice. I still got rushed to get ready because we were going to be late. We walked the twenty minutes there. I went into the Adventure Tower to the Safari room to find it closed with people sitting on the floor in the hallway. I was confused. “Have they started already?” I asked them in a whisper. They gave me a little shrug and encouraged me to open the door and see. I cracked the door a teeny bit, then a little more. Then I stuck my whole head in, and nothing. It was completely empty, and I had to rethink my instructions. Then I checked the little sign outside the door. Wake Up and Smell the Crayons didn’t start until 11:30. I went and collected my mom, who was signing her name on a clipboard and slowly realizing she was in the wrong class, then her and I got my little brother, who was casually chatting to the volunteers in his room, no one hinting to him or letting on about how incredibly early he was. We spent the time in the used book sale, where I managed to find another book. This one is about a secret agent. I went back to the Safari room and got comfortable in a chair as the only childless person in there, adding on I was the youngest. I could feel people’s eyes falling on me and then on my purity-ringed left hand as their curiosity peaked. I enjoyed that one. I took three pages in notes, thinking of each one of the little kindergarteners in my class at church. After that was lunch, involving us walking and walking, and cutting through another hotel, and walking, and bee-lining through a parking lot, and ultimately halting at a fence. There was a life guard on duty at a swim slide about four stories above us who we ended up yelling at just to find the exit. His advice was to jump the fence and promised not to tell anyone. Note, we’re screaming this “secret” back and forth. We jumped the fence, thanked him, and eventually went to Coco’s. I was disappointed, I’m sad to say. The next workshop I went to was with my mom for a medical transcription session. What it’s about, how to make money with it, and so on. It was very interesting. But I’m obviously still transitioning from childhood, because I was surprised that it cost money to do such a thing. Then I was floored with how much money it cost for the program. I’m interested. But I don’t know if I want to shell out all my money to do something I’m not sure I’ll totally enjoy. Those are my thoughts on it. Next, I broke off yet again for another Teaching Your Kid With The Bible workshop, which was pleasant. I still felt the stares, though. My last workshop was titled Teaching Preschoolers With Games, which I honestly thought would be kind of a fun swap-your-game-ideas session. But she simply advertised the board games she was selling and explained how they helped preschoolers learn thinking skills and such. 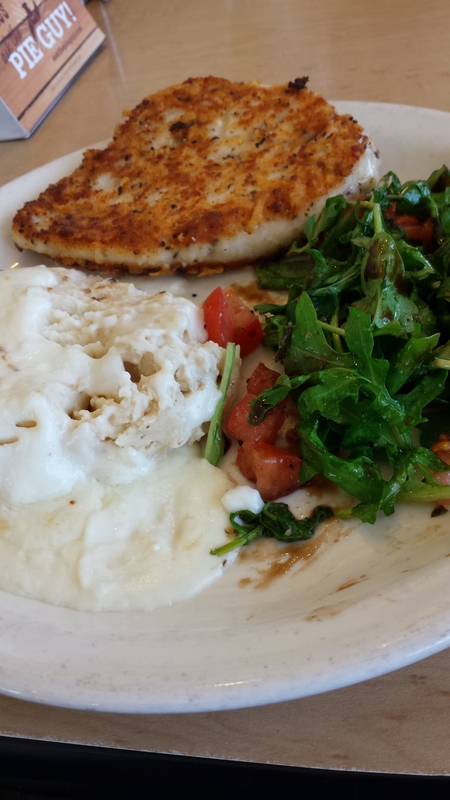 I was hungry again, which seems to happen frequently when I’m either A) In the middle of no where with no eateries in sight, or B) Surrounded by eateries that are super expensive so the decent ones are hotels and parking lots away. On the upside, I walked 10,000+ steps according to the pace tracker on my phone, and burned around 250 calories. That’s something. It’s probably why I’m hungry all the time. I feel bad for my mom though. I’m a total little kid. Kirk Cameron came to speak, but I was spent after my game-less game session and from starvation, so we ended up walking back to the hotel, dropping off books, my mom got to brush her hair (which seems to be a huge refresher to her), then went to Denny’s for a dinner of $2 pancakes and a sampler plate. It was heavenly. We returned to the conference to watch the showing of “Mercy Rule” after Kirk Cameron’s session. He went over his time, so we came in and were still able to hear him speak. I sat on the floor and started to laugh when I looked to my left and saw a guy taking an obvious selfie of himself wearing sunglasses with Kirk Cameron speaking in the background. He dropped down beside my brother and me and asked for clever hash tag ideas. I, of course, had to get in on this social media, so I whipped out my own phone and took a picture too. 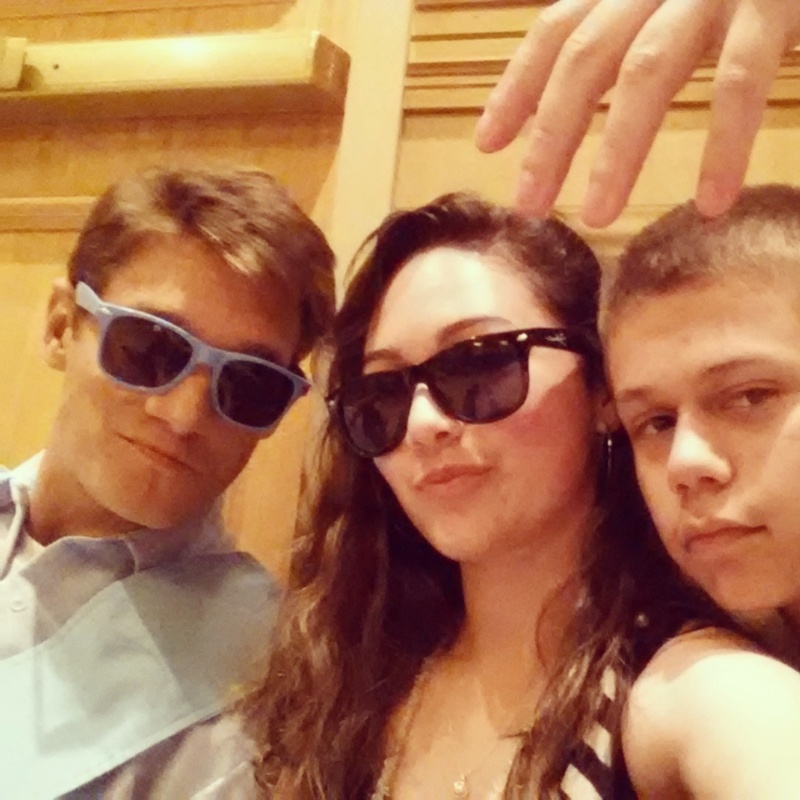 We had some giggly moments like we were oh so cool. Soon a man in a gold name tag came by and told us we couldn’t sit by the doors. Kirk Cameron was finishing up, so we said our goodbyes and my family went on to find some good seats for the movie as the crowd moved out. “Who was that guy?” My mom asked. He and I agreed we seemed familiar to each other. Maybe we did Generation Joshua together, but we never talked before. Social media does weird things to bring people together. Well, both he and I walked away with an extra follower. The big news of the night was that the movie stopped right towards the end when the laptop died. It was actually pretty hilarious. 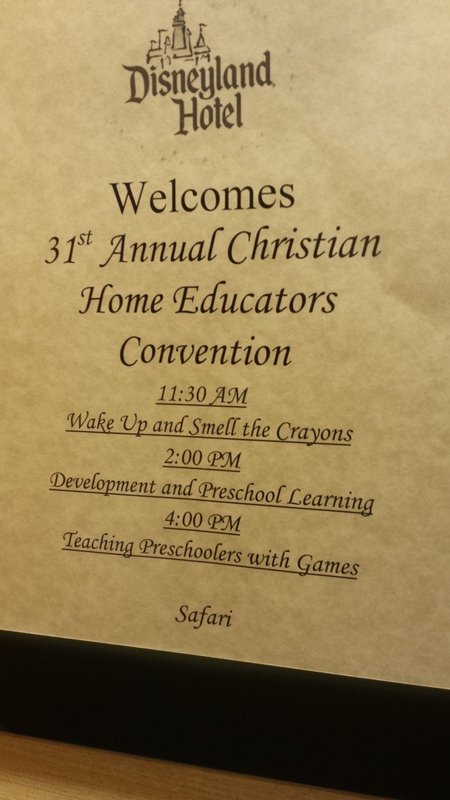 Only at a homeschool convention would this ever happen. 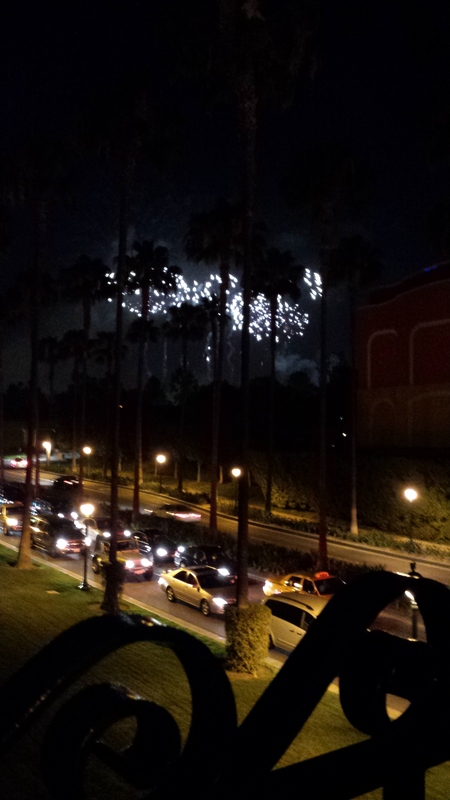 My family and I took advantage of the situation and left the movie early to see the 9:30 showing of the fireworks, but the best view we got was through the palm trees. It was fun walking Downtown Disney at night though. We came back to the hotel and crashed.